Only Enchanting - The More I Read. . . It's been a really, really long time since I've pulled an all-nighter to finish a historical romance, but that's exactly what I did with Only Enchanting. Was it perfect? No, far from it. I had an issue or three with it after finishing it. 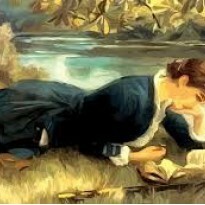 But, it kept me turning pages and wondering about certain characters' fates until the wee small hours of the morning. The first thing that struck me was the, er, rather unique names of the two main characters: Flavian Arnott, Viscount Ponsonby and Agnes Keeping. I had a book of saints as a child which made me nervous for this pair of lovers considering both 'Flavian' and 'Agnes' met such dire fates in the saint book. Beaten to death or dragged naked through the streets to a brothel and then slain with a sword doesn't exactly scream 'happy ending.' (That book gave me nightmares for years. Yet 'they' say fairy tales are gory and violent. Pffft. I snap my fingers at fairy tales.) Flavian Arnott has plenty to say about both their names, and after all, what's in name, right? "Lord Ponsonby -" she said. I did wince, however, when one of his friends from the Survivors Club shortened his name to 'Flave.' Let's just say my mind went way the hell somewhere else. Thankfully, this only happened a time or two. Just as a rose is still sweet smelling no matter the name, these two are a wonderful pair. Flavian with his good looks, mobile left eyebrow with its own ridiculousness detector, eyelids at half mast, and a subtle dry wit is just a delicious hero. When he and Agnes first meet at a harvest ball at Middlebury Park, his invitation to dance sets up a fun, lively banter between them. If there was one thing above all I loved about Flavian is his refusal to take himself too seriously. He could have been obnoxiously arrogant because of his wealth and station or cocky because of his handsome face, but he's none of those things. The image of this tall, attractive, urbane man 'hoofing' it on the dance floor made me chuckle. He suffered horrible head trauma and wounds in the war. His memory is full of gaps, has crushing headaches and a slight stutter which worsens when emotionally upset. I have to say this guy is lucky he's walking around. I mean, he was shot in the head, fell from his horse hitting his head, and then another soldier rode over him as he lay there. His recuperation was long and tedious - like a stroke victim learning to communicate again. Words were a 'jumble' - understanding them, saying them, choosing the right ones. He had 'forgotten about sentences. Not being able to say what he needed/wanted to say caused violent outbursts of frustration resulting in his stay at Penderris Hall in Cornwall for three years where he met the other six members of the Survivors Club. The annual meetings of the survivors are as beneficial emotionally as their extended stays at the Hall were physically. For Flavian, the bond he feels with the group is impregnable, healing, a 'lifeline.' They are his family. Agnes Keeping is a widow of three years living with her sister. The very first sentence in the book clued me in immediately that Agnes's world would soon be topsy-turvy. Words like that are guaranteed to put a large heart-shaped target on your back, er, heart in romance novels. Agnes is a 'good-looking woman' with 'fine eyes', and a 'mouth that looked designed for humor.' She's not extraordinarily beautiful, but she is inexplicably attractive to him. He associates her with feeling/being 'safe' which sounds, well, boring. For Flavian, 'safe' means trust. Like the other six members of the Survivors Club. Like his brother, David. He instinctively recognizes he can trust her. Agnes is practical, a little reserved, a virtuous widow not interested in dalliance, comfortable with her life, and she falls very hard for Flavian almost immediately. 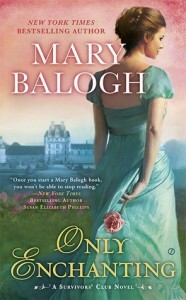 One of the reasons I enjoyed Only Enchanting so much is the way Mary Balogh captured that initial euphoria of falling hard in love and the distinction between 'in love' and 'loving.' Agnes did not want to fall in love and yet, for her, it was pretty much at first sight, without her conscious agreement, approval, or action. When she and Flavian waltz at the ball, she's almost giddy, entranced by swirling colors and lights of the ballroom, the music, the laughter of the other dancers, the way the candles and flowers smell, the dizzying, twirling, exhilarating motion of the dance, and Flavian, unable to look away from his 'sleepy yet keen eyes' or find something sensible to say. Meeting Flavian again months later brings those uncomfortable emotions bubbling back to the surface. There's also a 'strange irony' in the divergent emotions elicited by a potential marriage to each other: Agnes feels distinctly unsafe at the prospect while Flavian can't resist the idea that Agnes will make him feel safe. Falling in love doesn't require knowing the other person, but part of loving is a decision to know and learn about the other person, wanting to do the things that make them happy, to work for those moments that bring mutual happiness. The way these two begin to know each other is simply lovely. By the second time Flavian asks Agnes to marry him, both acknowledge that there's more to knowing each other than a summation of dry facts or assumptions about character. Agnes and Flavian have a lot in common with that old fable about the six blindfolded men attempting to define an elephant by touching only one part of it. The trunk of an elephant feels like a snake; the tail, a rope; the ear, a fan; the tusk, a spear. An elephant appears to be all those things taken separately, based strictly on what is familiar, but is, in fact, none of those things. Agnes believes Flavian to be a 'rake', a 'libertine', a 'seducer', a 'flirt.' He looks at Agnes and sees 'sensible', 'vaguely pretty', definitely not 'dazzling' to the eye or mind. Ordinary. Both are unable to clearly see each other until they take off their blindfolds. Agnes was a little obsessed with painting that field of daffodils, trying and failing many times, until she painted them from a different perspective, looking down on the daffodils as the sun did. She finally put on canvas the daffodils the way she saw them in her mind and her heart. So, too, do Agnes and Flavian come to know passion and love do not have to be mutually exclusive. At one point after they marry, when Agnes pulls that old 'I'm going home to Inglebrook' line, I feared Only Enchanting was about to devolve into a tired romance cliché. She had reason to be blazingly angry at Flavian for keeping an important piece of his life hidden from her. His lie by omission allowed her to be blindsided, left her vulnerable to an enemy, shook her confidence. But, she is not a victim, and she laid the law down to him in one of the best scenes in the book. 'It is to be a marriage for seven days, then, is it?' he asked. Good heavens, where had that come from? Her heart was thumping so loudly that she was half-deafened. He had not moved or changed posture. But his eyelids had drooped half over his eyes, and his mouth had curved upward slightly at the corners, and he was watching her keenly. I did have a BIG problem with how Velma, Lady Hazeltine, suffered no repercussions for her scheming, her lies, her manipulation of people and their emotions for no better reason than a burning ambition to be a Viscountess. She deliberately, coldly, and cruelly broke David's (Flavian's brother) heart in her pursuit of a coronet as he lay on his death bed. She spread nasty gossip about Agnes's mother to sabotage and publicly humiliate Agnes for no reason other than spite when 'sowing mischief' between Flavian and Agnes failed to make Agnes run away. Velma is a poisonous snake, and unless she runs off to Sweden with a lover, that snake will be living right next door to Flavian and Agnes for the rest of their lives. Be afraid, Flavian and Agnes. Be very afraid.